...and amazingly GTM won some awards. (^_^)"""
YaY! An award from one of my fav fanfic-writers! I feel so honoured ~^_^~.. Thank you so much Jennie!! What a CUTE award!! It has lil' Marron there....and lil' Trunks too (*_*)! One person's missing... WHERE's GOTEN?! LOL This Award is from Son Piper of PiPerZ HomEPaGE! Thank you so much, Piper-chan! Thank you Queen Bulma!! Maybe GTM should give you an award to you too for being a talented writer! Awarded by Makaze of DBZD Awareness! GTM very first award!! Thank you! 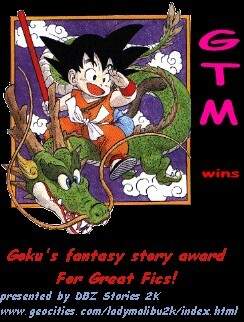 Then the next day, GTM won another award!! Yay! This time it's from Kibon Tokumei of Chichi's Cell. Can We Have Some More? ^_^; tee-hee!